TheToyz 5 LED Spotlight Roof Light Bar « Big Squid RC – RC Car and Truck News, Reviews, Videos, and More! There are a lot of people out there looking for the perfect combination of scale looking parts to make their rig the coolest one at their local crawl spot or trail. 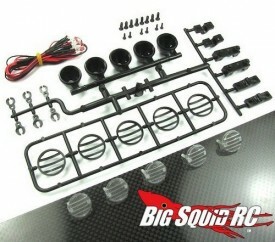 The problem is there just aren’t that many companies making cool looking scale upgrade products. The crew over at TheToyz saw the need for scale products and have introduced a new 5 LED Light Bar for all you scale enthusiasts. 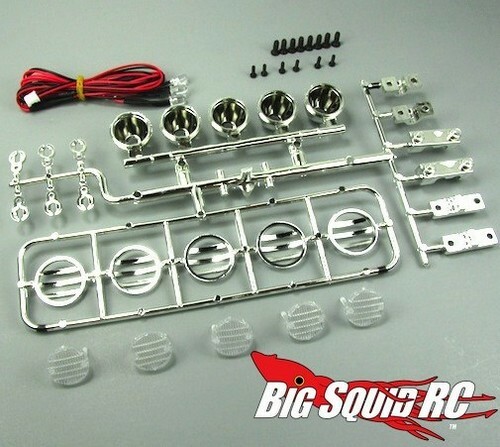 Available in either black or chrome, the kits come with bezels, 5 LED’s, and a 4.5″ wide light bar to help make your rig the envy of your scaler buddies. These kits are easy to put together, affordable, and can put out some much needed light for those late night trail sessions. The chrome version has a part number of #TOYZ 747 Chrome and a street price of $12. The black version has a part number of #TOYZ 747 Black and comes in a bit cheaper at $10. Click THIS LINK for more information over on TheToyz official website. Want to read more about scale realism? Check out THIS LINK right here on BigSquidRC.